Ponytails are an eternal hairstyle favorite due to its convenience and ease of use. Ponytails need not be boring! Rebel from the usual pony by donning tweaked versions – unkempt low ponytail, side-swept ponytail with curls, spiky high top ponytail, flipped ponytail or a triple straight-up ponytail! See more ponytails for grown-ups from our extensive list below! Itching for a super sleek hairstyle? Opt for the wet look! A wet look ponytail wi..
Itching for a super sleek hairstyle? Opt for the wet look! A wet look ponytail with deep side part can make the wearer look very fresh, clean and neat. 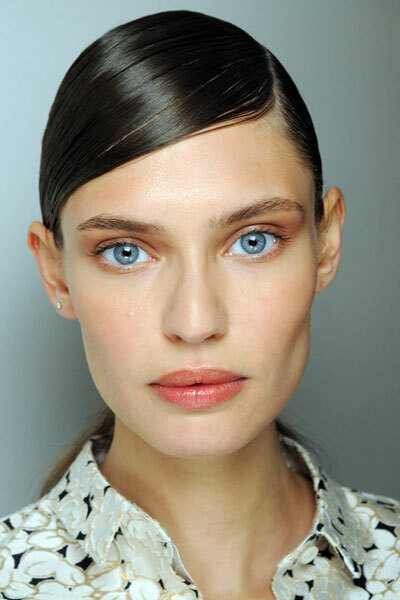 For an intense sheen, apply a water-based gel that’s specifically made for this kind of look after washing your hair. Use a small amount then add as needed. Gently create a deep side part using a comb before doing a ‘tail. Kate Hudson can make even the simplest hairdo look awesome! Kate wore her gold..
Kate Hudson can make even the simplest hairdo look awesome! Kate wore her golden blonde hair in a high ponytail for the opening night of The Producers in 2003. To get Kate’s look, blowdry your hair straight. Use a flat iron if you need to. Apply a small amount of smoothing serum to tame flyaways, and brush hair into a high ponytail at the crown. Secure with an elastic band. Taylor Swift’s long, blonde hair looks great in this low, side ponytail. Sparkly h..
Taylor Swift’s long, blonde hair looks great in this low, side ponytail. Sparkly headbands dress up this look to make it more formal and extra special for prom. If you aren’t blessed with beautiful, naturally-curly hair like Taylor, you can add curls by using hot rollers or a medium- or small-barreled curling styling wand. Be sure to use lots of finishing spray to keep the curls intact as you dance the night away! Freida Pinto wore her gorgeous, long, black hair in a simple high ponytail to a p..
Freida Pinto wore her gorgeous, long, black hair in a simple high ponytail to a premiere in Cannes in 2012. A ponytail can be worn during the day or for a night out. The classic updo shows off a pretty complexion and brings out your best facial features. Fine tune the modest ponytail by curling the ends and creating a mild pouf on top..
Fine tune the modest ponytail by curling the ends and creating a mild pouf on top just like Ireland Baldwin’s! This is the ‘tail for women with super fine strands. The curls will add volume and omit a limp-looking ‘tail. Spritz a sea salt spray on the roots until the edges for good texture and volume. Ponytail with straight across bangs is such a youthful and adorable style! If you..
Ponytail with straight across bangs is such a youthful and adorable style! If you want heavier fringe, go for the blunt. Girls with round-shaped faces should opt for blunt bangs with the sides longer than the center and the middle part shouldn’t be too wide. Women with finely textured hair should ask their hairstylist to start the bangs higher for more bulk. While everyone is still busy talking about Taylor Swift’s moving 2014 Grammys p.. The humble ponytail is on trend and variations have emerged as of late. Karmen P.. The humble ponytail is on trend and variations have emerged as of late. 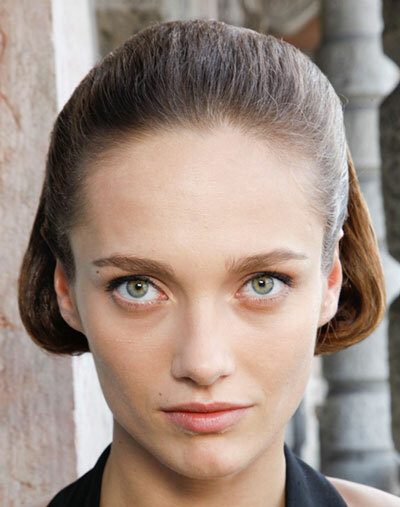 Karmen Pedaru’s folded sleek ponytail is one of the most curiously unique options we’ve seen. Give this one a try if you’re bored of the classic ponytail. Brush your hair into a high ponytail then tie with elastic. Secure the ends with a clear elastic as well before folding it inwards and keeping it still with bobby pins. Spread the folded area sideways before misting the style with hairspray. Modernize the celestial pony by making it high! There are numerous ways to wear..
Don’t ever tell Nicole Trunfio that an effortless hairstyle cannot have a big impac..
Don’t ever tell Nicole Trunfio that an effortless hairstyle cannot have a big impact because she made it happen! Put some exciting detail on this simple hairstyle by creating a mild pouf on top. Parting your hair in the middle should only be done at the front – about two inches from the forehead; brush back the rest. Muss up the ends for a chaotic finish. P.S. We love Nicole’s baby tendrils! Michelle Dockery kept her hairstyle simple and relaxed at the 2014 SAG Awards i..
A demure hairstyle fit for royalty. Sophistication cannot be denied despite the sim..
A demure hairstyle fit for royalty. Sophistication cannot be denied despite the simplicity of this middle part ponytail ‘do. Baby hairs all around the top of the forehead makes the hairstyle look relaxed. If you prefer a slightly different twist to this classic coif, braid the ends or curl them for a hip look! Here’s an interesting twist to a low ponytail courtesy of actress Rose McIver. A..
Here’s an interesting twist to a low ponytail courtesy of actress Rose McIver. Avoid an unsightly dent to your locks due to elastic by going without! This style will be a breeze for women with thin hair with natural waves. How-to: Apply a texturizing mousse before drying hair. Tease the front and crown a little for a good lift. Divide hair into two sections – upper (thicker section) and lower. Twist the lower section loosely and secure the base with pins all around. Slick out the sides as you gather the upper section at the back; make sure that it’s close enough to the lower section. Attach the upper section to the lower part using U pins. Set the coif with hairspray. Ponytail worn at the nape is the trending hairstyle during the third quarter of 201..
Ponytail worn at the nape is the trending hairstyle during the third quarter of 2013 until 2014. Model Elena Bugaeva’s simple low ‘tail is super easy to do! Brush your hair back (right on top of your neck) and secure with elastic. You can do a few tweaks like hair parting or adding a pouf just like Elena’s. The next time you feel like tweaking a standard pony, make it higher! Jamelia’s l.. The next time you feel like tweaking a standard pony, make it higher! Jamelia’s long, sleek sky-high ponytail with big waves is a day-to-night hairstyle. 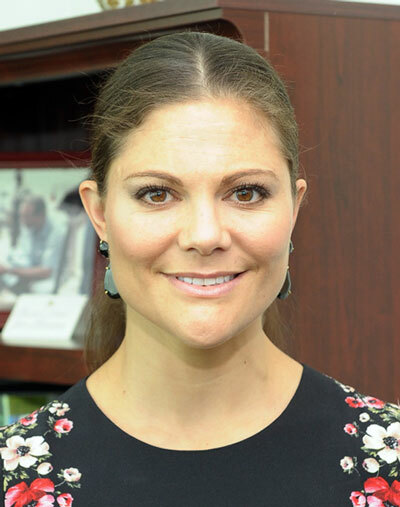 From the office to a holiday party – this coif is a winner! Jooge the ends to pump up some volume and add more texture to the look. You can also wrap a faux braided hair around the base as a flipside to this style. Party rockin’ hairstyle alert! Hannah Simone’s elevated ponytail with blunt fringe..
Party rockin’ hairstyle alert! Hannah Simone’s elevated ponytail with blunt fringe is a big do during a joyous fête. Apply some gel to your tresses to endure a sleek finish. To make the style extra neat, don’t forget to wrap the base of the ponytail with 2-3 inch section of hair. Don’t have enough length to pull this off? No problemo! Use a faux ponytail! Just make sure that it matches your hair color very well or at least a shade darker or lighter. Mess up the classic ‘tail for a cool, devil-may-care look that’s astute but defini.. Mess up the classic ‘tail for a cool, devil-may-care look that’s astute but definitely not boring. Shake your hair before doing a ponytail to make it go a bit wild. For an added chic effect, rough up your blunt bangs then part it in the middle. If your fringe refuses to cooperate, apply some gel before styling it. The come-hither stare and seductive pout can be copied too. Do it!